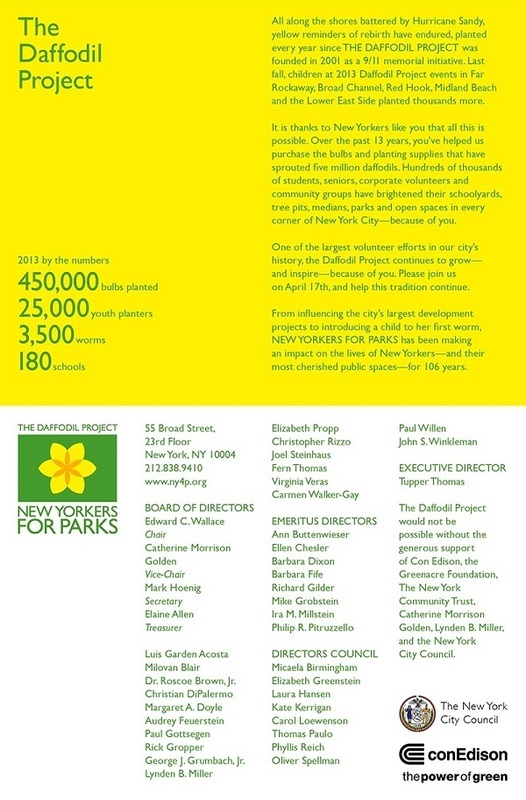 "The NY4P Daffodil Breakfast, a springtime ritual for the past 12 years, honors individuals and organizations whose dedication to their neighborhood open spaces exemplifies the Daffodil Project’s spirit of volunteerism." HPSBG was represented by Ms. Grace Binuya and Ms. Anitra Lauro at the breakfast to honor the HPSBG and the students of PS 48's commitment to remembering the past through the development of a living memorial. PS 48's Grace Binuya speaks on NY4P's daffodil project at Drake Park, site of HPSBG, in Hunts Point where over 300 students planted 1,200 daffodil bulbs. 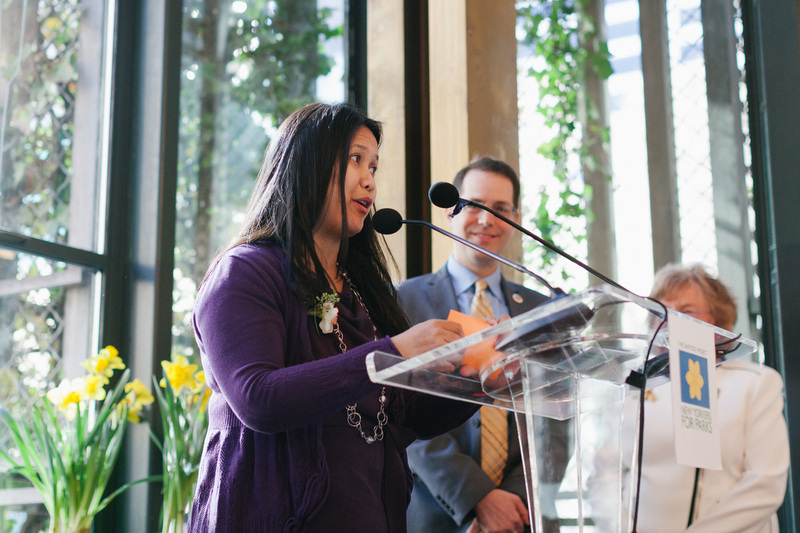 NY4P honors various individuals and organizations, including HPSBG's Grace Binuya and Anitra Lauro, for improving their neighborhood's park spaces. New Yorkers for Parks (NY4P), NYC Parks, and PS 48 came together on Thursday, October 24, 2013 for a day of service learning. This commemorative daffodil planting by over 300 elementary students from PS 48 developed a living memorial in honor of September 11 and the Hunts Point Slave Burial Ground (HPSBG) Project. 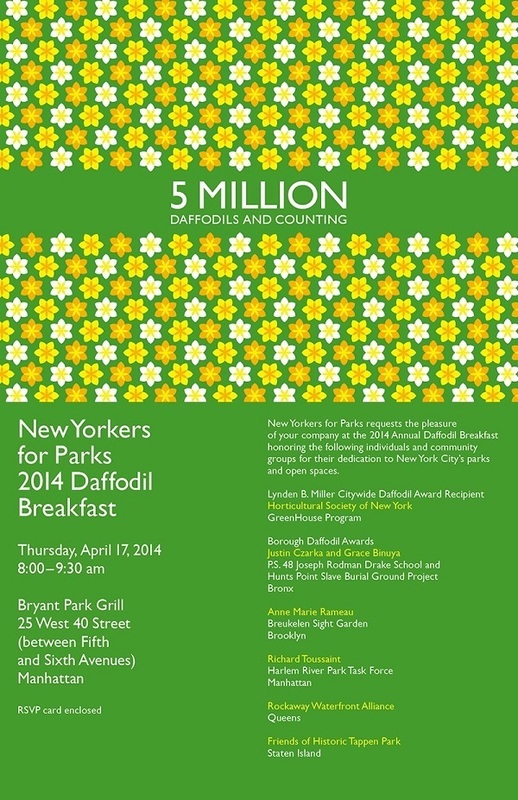 The Daffodil Project was hosted in Drake Park and the South Bronx Schoolyard Garden and Outdoor Classroom at PS 48. NY4P donated over 1,200 daffodil bulbs that were planted by the students using soil and support provided by NYC Parks. Photo Credits: Phil Panaritis, Nancy Hamilton, and Mary Brown. Ps 48 Says "thank you"
Over 300 students and teachers say, "Thank you New Yorkers for Parks (NY4P) and NYC Parks!"